The Irish Georgian Society is delighted to play host to St. Patrick’s Festival’s I Love My City cultural programme. 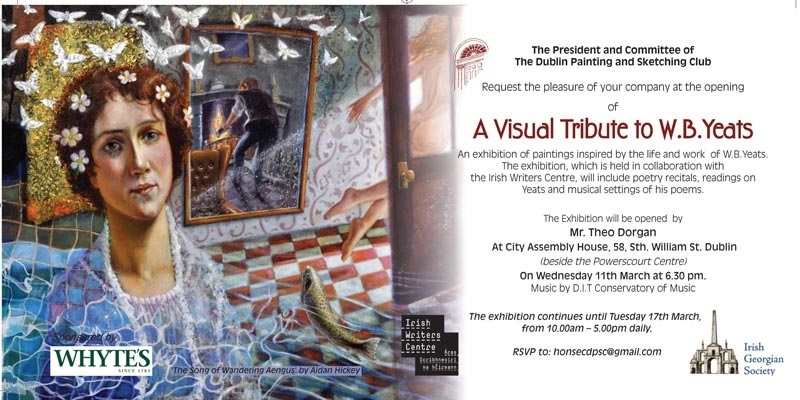 The Dublin Painting and Sketching Club with The Irish Writers Centre will present an exhibition of paintings inspired by the poetry of W.B Yeats. Poetry recitals, short readings on Yeats and musical settings of his poems by harpist Claire Roche celebrate the work of one of Ireland’s greatest literary icons, in the beautiful Georgian surrounds of City Assembly House. Poetry Readings & Harp Recital with Clare Roche: Sunday 15th March at 3pm. Tickets €5 from www.irishwriterscentre.ie. Informal Poetry Readings: Monday 16th & Tuesday 17th March from 2.30pm. Free events, no ticket required.